A few months ago, I had a long conversation over dinner with entrepreneur and investor Michael Dornbrook. I got to hear how his startup company went from long-suffering video game creator to one of the most successful companies of its time. Michael has a great story. He was one of the leaders of the company that created Guitar Hero — the mega-hit interactive music game launched in 2006 that became the fastest-growing video game in history. I didn’t ask Michael what it was like when the company got big. I asked him what it was like when they were struggling to survive. How they happened to make the turn to grow fast and become a really big deal. What it was like before they were famous. Michael spent 13 years with the company, named Harmonix. During the first nine years, Harmonix launched several unsuccessful interactive music games – interactive karaoke, exhibits at Disney World’s Epcot Center and music games with Sony. Lots of tries, but no successful hits. Enough to stay alive, but not more than that. They had created dozens of ways to get people to say “Wow,” they just couldn’t find a way to make a successful business out of it. One that didn’t require a personal 30-minute demo to get users excited and hooked. This is a familiar story. There are millions of passionate entrepreneurs who can get people to a “Wow” moment with a lengthy personal demo, but can’t find a way to grow sales fast to a larger crowd. Did they know Guitar Hero was going to be big before it launched? Michael told me how they tried lots of concepts, but hadn’t created a product that took off. They learned a lot and didn’t stop trying to make something truly amazing. They even pitched one concept to Microsoft’s Xbox team and the guy in charge said “No deal, but if you had a guitar or something, it probably could work.” They didn’t hear that and kept developing other ideas. They would build products for a year, invest in big launches and then see what happened. For nine years. Finally, they invested nine months to create the Guitar Hero software and worked with a hardware partner to build a guitar-shaped controller with five buttons on the neck. They used all their money to finance the manufacturing to build 100,000 units. Then they went to all the major retailers. Only two retailers put Guitar Hero on the shelf for Christmas at launch. Best Buy was one of them. 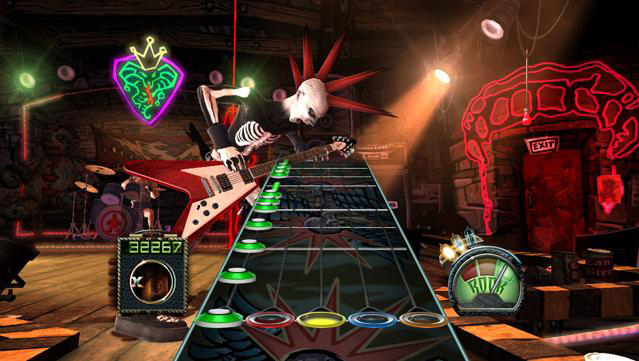 Guitar Hero was just too new and it was totally unproven. And the box was too big on the shelf. It didn’t sell well at first. Shoppers didn’t get it. Store salespeople didn’t know about it. So Michael took a chance to get things going. He sent an email to a few hundred fanatical users of Harmonix’s previous games. “Just go to Best Buy, open the box and play Guitar Hero in the store. Just show people what it is,” he told them. Just show it. Those fans played Guitar Hero in the stores. Initially they drew small crowds. Then bigger crowds. Then store managers told other managers to demo it in their stores to draw crowds. The crowds came. Best Buy sold 8,000 units in two weeks. They ordered the other 92,000 and sold out that Christmas season. Then other retailers came to Harmonix with bigger orders, and sold out. The next year, Harmonix sold 3 million units. The following year, over 10 million units. They created new Guitar Hero editions, more songs and another product called Rock Band. It was a mega-hit and a multi-billion game franchise that almost didn’t happen. Michael and the Harmonix team survived long enough to keep trying new things to see what could work. “We never knew when one of them would really take off, so we just kept trying,” Michael said. Now Michael is a prolific angel investor and active with organizations that support entrepreneurship in Boston. If you can’t get people to understand it quickly, it’s not a business. If your customers don’t love it and say great things to their friends, it’s not a good business. If you don’t create raving, loyal fans, it’s not a great business. Michael tells a detailed version of this story in this video interview, if you’re curious.